It’s that time of year again, and the Great Bear Foundation is getting ready to head north to polar bear country! Each summer, when the sea ice breaks up on Hudson Bay, the polar bears swim to shore and spend the summer dispersed across the tundra along the Hudson Bay coast. The Hudson Bay and James Bay populations are the only polar bear populations to spend a significant amount of time on land, and they are the world’s only migratory polar bears. While on land, these bears enter a state known as “walking hibernation”–they are physiologically in a state similar to a hibernating grizzly or black bear, but they are awake and alert on the tundra. This fascinating adaptation allows the bears to conserve their energy during the ice-free months when food is scarce, but they are also able to take advantage of any opportunistic food sources they might find, like beached whale carcasses. The bears typically come ashore in July, so when we visit Churchill, they will have been effectively fasting for three to four months. While on shore, they do nibble on berries and kelp, and maybe eat a few birds, or whatever they can scavenge on the beaches and tundra, but without the sea ice, they have no access to their main dietary staple, the ringed seal. In October and November, sensing that the sea ice is about to form again, the bears all converge at Cape Churchill, waiting for the ice to form. The Churchill River dumps cold, fresh water into Hudson Bay, and this water freezes sooner than than the salt water of Hudson Bay, so ice starts to form at the mouth of the Churchill River. Meanwhile, come November, the cold north wind starts to prevail, pushing this ice to the shore, where it starts to form land-fast ice. This is the first ice to form in the area, and it creates an ice shelf, where the sea ice forms. 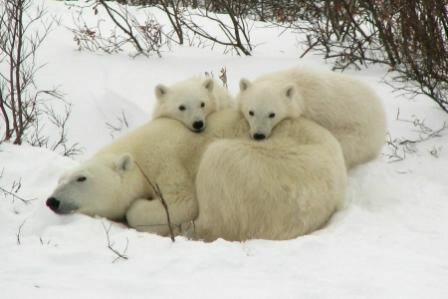 Right now, bears are aggregating around Cape Churchill, waiting for the first ice to form. Once the ice forms, the bears will head out on it, and wait at the edge until more ice forms. The ringed seals start to appear about 40 miles off the shore of Cape Churchill, so when the ice extends that far, the polar bears are back in business, and able to start hunting seals again. This is like Thanksgiving for the polar bears, and it ends three to four months of food scarcity. The Great Bear Foundation has been making annual pilgrimages to Churchill every year since 1984, bringing interested people to Hudson Bay to observe the polar bears in their natural habitat. Our Polar Bear Ecology Field Course is open to the public of all ages, and it’s been a life-changing experience for many people over the years. Join us next year for our annual trip, November 1-11 from Montana, or Nov 2-10 from Winnipeg. Click here for more information, or contact us at gbf@greatbear.org. You can follow our trip on our Facebook page, and don’t forget to “like” us there!